April is almost over, and I can't believe this is only my second structured product pick for 2018. Originally, I planned to introduce at least one structured product per month, but the financial markets have just not played ball. And, given the nature of these products, I would rather send you nothing than introduce you to a product that didn’t meet my stringent criteria. 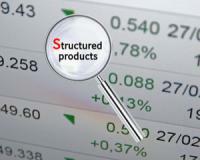 You see, there is certainly no lack of structured products floating around at the moment, but if you analyse the terms of the current products you’ll see what I’m talking about. The pay-offs, the capital protection and general offering are far below what was available in 2017. Well, I’ve just released my new book - Little book of Big Income - 7 Filthy secrets to get rich quick – In it you will discover how ordinary people can become extraordinarily wealthy just by applying some fairly simple techniques – techniques the rich use to get even richer. But the secret to how they do it will astound you – the rich don’t do anything special, they just do it in a very special way, as I’ll explain in my e-book. Why the glut of sub-standard products? Well, uncertainty or what financial types call “volatility”, spiked dramatically at the start of the year. When the markets are uncertain, it’s very difficult to create price “guarantees”. The environment is just not right to create them. The financial products used to build these products become more expensive and, as financial institutions begin to err on the side of caution, they also tend to charge extra for the protection. As understandable as this is, it unfortunately means most of the products this year simply haven’t been attractive enough to consider buying. But if you followed our structured product picks last year, you are in at exceptional levels and now have significant upside, often with TOTAL CAPITAL PROTECTION. It’s true, volatility has reduced slightly after the crazy first quarter, but there’s another reason today’s product stood out for me. It has an exceptional risk/reward payoff. Here are the details of the product. Even, compared to some of the 2017 picks, this product’s guarantees are exceptional! How often do you find an equity market linked investment that will GAURENTEE at least 125% of your money back, no matter what happens to the actual underlying market? After all calculations are done, this minimum return almost gets you to a point at which you’re looking at a money market substitute. To “pay” for this minimum return however, the guaranteed upside, if the market is positive, is a little lower than I’d have expected. But even then, to generate ONLY a 62.5% return if the market is 0.1% positive (and still have the option to make more if the market runs) is exceptional. If there's only one thing I know about you it's that you want to make BIG money in 2018! The kind of money that lets you live the life you've always dreamed of: A life where the golf course is your office... A life where your kids are guaranteed the best education - anywhere in the world... A life where an annual overseas holiday is the norm, not the exception. Today I want to introduce you to a great opportunity to turn your love for braai, beer and Super Rugby into instant cash! And it’ll take you less than 10 minutes to do it – even if you’ve never bet on anything in your life. This is equivalent to a simple interest rate of almost 5% per year. Remember your tax rate is also greatly reduced. If you were a high-income individual, you would need an account that paid a simple interest return of more like 8% per a year to match this product after taxes. If the market is positive, the return shifts up to 62.5% or a simple interest rate north of 10% a year. All that is required for you to earn this return is for the market to be as little as 0.1% higher. For a high income individual the return on an alternative investment would need to be close to 20% a year to match it. As many of you know, the currency is not a one-way bet. Over the last couple of years many investors have burnt themselves trying to pick the direction of the rand. This product avoids that entirely and puts the investor in a neutral position. We may be in the second longest bull market in history, but it’s always possible for it go on for longer. In this scenario, your upside potential is unlimited. Other than the guarantee, this is the best feature of the product. Your profits are taxed at a greatly reduced rate. Always remember that it doesn’t matter what returns are before taxes. The only thing that you should care about is how much you make after tax. If you are interested in chatting to me directly about his product, send an email to support@randswiss.com and I’ll arrange a time for us to speak. P.S. There’s ONLY A FEW DAY'S LEFT to grab a copy of The Little Book of Big Income. It’s your last chance to join hundreds of investors who have already got theirs.